30 Second Wine Advisor: Two ways to smell?  Two ways to smell? We smell through our noses, but we also smell again when we taste. Pay attention to the differences, and add another tool to your wine-tasting kit. A decent Piemontese red, old-style and complex; a bit supercharged by the hot summer of '03 in Europe but still fine. We smell with our noses and taste with our mouths, right? This truth seems so self-evident as to need no further examination. As it turns out, much of the sense that we call "taste" is actually based on what we smell; and you do in fact receive aroma impressions not only when you sniff a sample of food or drink but when it's in your mouth as well. This may seem like mere trivia, but it has significant practical implications for wine tasting: By paying conscious attention to what we might call "nose smell" and "mouth smell," we add another dimension of analysis when we're paying serious attention to our wine. Bear in mind that our taste buds - tiny flavor receptors on the tongue and walls of the mouth - are equipped to sense only four or five specific flavors: Sweet, sour, salty, bitter and, somewhat controversially, a fifth taste that the Japanese call "umami," a difficult-to-translate term that falls somewhere in the neighborhood of "meaty" or "savory." On the other hand, our olfactory receptors (why don't they call them "smell buds"?) are equipped to distinguish among more than 10,000 separate aromas. Ten thousand smells. Four or five tastes: In other words, we get at least two thousand times more information about food or drink from smell than from taste. But, returning to the point of today's dissertation, smell is not all about the nose. The sensory mechanism that tweaks out those 10,000 different aroma molecules and reports, "That one's rare grilled beef, this one's toasty pain grillé and that one over there, eeuuuwww," resides not in the nose but the olfactory epithelium, a little patch about the size of the bar code on a wine-bottle back label, up at the top of a bony cavern inside our skulls at the base of the brain. Yes, smells reach the olfactory epithelium through our noses. But smells also get there by an alternative route: Inside the mouth, at the back of the palate, an internal chimney called the "retro-nasal passage" delivers another aroma shot straight to the brain, giving us a second chance to smell what we're about to swallow before it goes down the hatch. This mechanism likely evolved to give early humans a second line of defense against consuming rotten or spoiled food. But in our kinder, gentler modern times, it gives us another way to enjoyably analyze our wine. This is not entirely trivial, as you'll sometimes find - as I did with today's featured wine, an idiosyncratically spelled "Nebiolo" from Alba in Northwestern Italy's Piemonte - that the nose smell and the mouth smell deliver significantly different impressions. In this instance, the traditional swirl-and-sniff technique brought up a deliciously complex aroma set featuring black fruit, dried fruit and a nice earthy touch of something surprisingly reminiscent of hot tar, a typical characteristic of Nebbiolo. But when I got the wine in my mouth, along with the essential sweet, sour and slightly bitter mix that the taste buds are equipped to deliver, the retro-nasal passage went to work and sent my aroma sensors a distinct, lovely whiff of fresh spring violets - another Nebbiolo characteristic - that wasn't evident directly from the nose at all. Next time you're tasting a good wine, take an extra moment to pay attention to what you're smelling when the wine is in your mouth. I think you'll find it an interesting way to enhance your tasting pleasure. FOOD MATCH: Needs the bold, robust flavors of red meat, even game, or perhaps strong cheese. It was a delight with the lamb shanks braised with herbs that I'll feature in tomorrow's 30 Second Wine Advisor FoodLetter. VALUE: Rising well above everyday status at $30, but as a hearty companion to a fine roast or cut of red meat during the holiday season, it's certainly worth consideration against other wines in the same price range. WHEN TO DRINK: Although Nebbiolo d'Alba is not an ager like its siblings Barolo and Barbaresco, a good, ripe yet balanced example like this will easily cellar for seven or eight years and perhaps a decade. 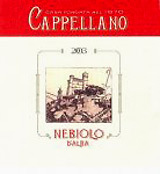 Chambers Street Wines in NYC still has a small supply of the Cappellano Nebiolo d'Alba. Click this link for the shopping cart.